I don't know whether it has to do with their shape or their tender texture but I keep coming back to this homey pasta. It always turns out very soft thanks to the dough based on mashed potatoes. And it goes unbelievably well with the simplest sauces like tomatoes or pesto or (why go too far?) - just with good olive oil and fresh herbs. 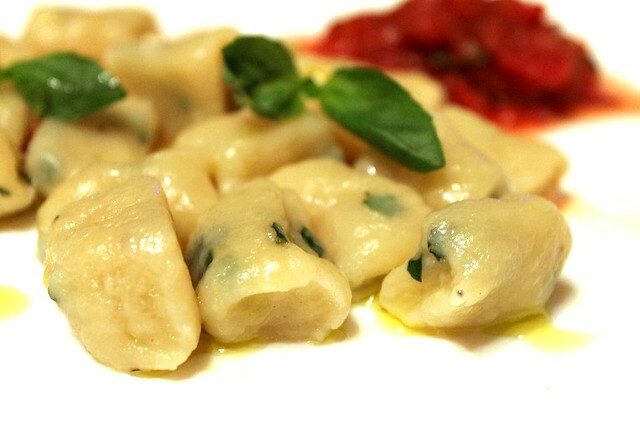 Making the pasta itself is not fast and will take some 1-1.5 hours depending how skilled you are in rolling the gnocchi. Thus it is wise to make two or three batches at once and freeze them. Once the pasta is done, all the cooking together with making the sauce is under 15-20 minutes really. I can do it even when I'm very hungry already (especially if I have some olives to snack in the meantime). I'm not pretending it is right recipe for gnocchi. It is just the one I picked for myself. The pasta is eggless, based on mashed potatoes and flour. It works well even if you don't have any special pasta flour at hand (and just use all purpose flour) and yields tender lovely gnocchi in 2-3 minutes of boiling. Boil the potatoes for 20 minutes till tender. Drain and mash well. Mix in the salt, pepper and basil. In several batches mix in the flour. Knead the dough on a floured surface for a couple of minutes. If it keeps sticking to your fingers add a little bit of flour. Roll the dough into sausages about 1 cm thick and cut them into gnocchi 2 cm long. Freeze the gnocchi you are not immediately using. Place the rest in the fridge of a floured dish. To prepare the sauce heat the oil in a medium pan. Add the garlic and cook for 1-2 minutes till it is golden. Discard the garlic and add the onion. Cook stirring on medium heat for 5-7 minutes till the onion is soft, but do not let it brown. Add the tomatoes, season with salt and pepper and cook for 2-3 more minutes. Stir in fresh basil. Boil the gnocchi in a lot of well salted water for 2-3 minutes till they float on the surface. Drain and serve immediately with tomato sauce and olive oil. yummy! love when you post vegan recipes. Thank you! will keep doing so:)!